Cabinet Refacing Atlanta: Is Cabinet Refacing More Affordable Than Remodeling? 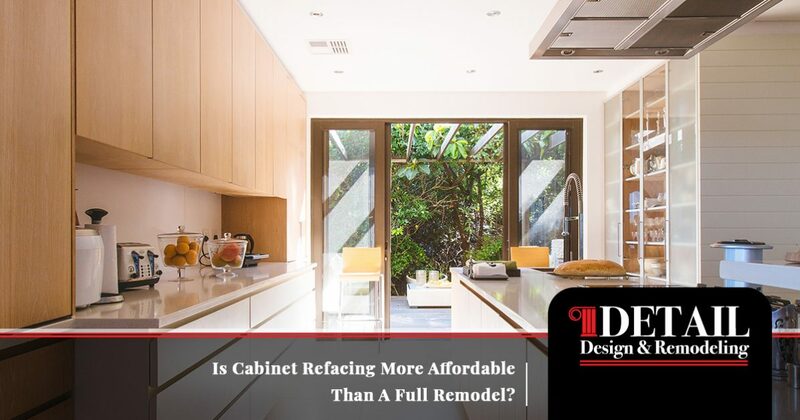 Is Cabinet Refacing More Affordable Than A Full Remodel? As a Georgia homeowner, you are always on the lookout for cost-effective home renovation services that can deliver a high level of quality without the massive price tag. There are many considerations that go into large-scale projects such as your kitchen remodel. From the style and materials used to the installation technique itself, every aspect of the project needs to be accounted for to ensure a quality outcome. No matter how efficient or accurate you are, the budget always seems to be the biggest deciding factor in any remodeling decision. Instead of paying for a full-scale cabinet tear-out, you may be able to benefit from kitchen cabinet refacing services. Detail Design & Remodeling is here to serve as your trusted team of home remodeling contractors, offering quality outcomes that are sure to exceed your expectations while staying within your budget. We offer services ranging from custom cabinet fabrication to cabinet refacing in Atlanta, serving the greater area as experienced and licensed general contractors. If you’re curious about the cost differences between cabinet refinishing, refacing, and a complete tear-out, watch the video and read below to find out. Then be sure to check back for more video blogs to come! The level of service you choose will greatly affect the total price of your kitchen renovations. Two major factors play into the cost — labor and materials. Any service that you choose will require labor from a skilled contractor, which is normally charged by the hour based on their skills and qualifications. The cost of materials is also unavoidable, as updating your home’s interior requires new or reused components for a fresh outcome. The following three types of cabinet services will vary widely in price depending on the labor and material required to match your exact expectations. This service is a top-down remodel that includes tearing out your existing cabinet boxes, doors, and hardware and replacing them with new materials. You will be left with an entirely new space, complete with brand-new components that are sure to look great while also increasing the value of your home. This service can include custom cabinets to deliver a higher level of personalization to match your home’s unique style. If your kitchen’s current cabinetry is looking a lot worse for the wear, this option will deliver the best long-term results. Cabinet refacing is a great option, but only if your cabinets can be restored properly. Our home remodeling contractors can work with you to determine the best approach for revitalizing your space. New floor plans can be created to better suit your needs, whether it’s expanding the dining area for entertaining or finally having enough room to open your stove. Keep this in mind when determining your remodeling budget. Cost: $$$ The increased labor and cost of materials means a full tear-out will cost you about twice as much as refacing. Each of these sections is a part of our quality cabinet refacing in Atlanta, where each decision can play a role in the final price. Our experts will “reface” your cabinets, updating the doors and veneers to create a quality appearance in your kitchen. Cost: $$ Refacing is more cost-effective, requiring less labor and fewer materials to complete the job. On average, you can expect to pay half the price of a full remodel. Homeowners seeking the most cost-effective avenue for updating their existing kitchen cabinets can benefit from cabinet refinishing. If your boxes and doors are looking worn out and dull, our professionals can help with sanding and finishing services to refresh and renew your space. Requiring the least amount of labor and minimal materials, cabinet refinishing can provide big improvements at a modest cost. The benefits of cabinet refinishing are only available under certain conditions, though. Medium-Density Fiberboard (MDF), for example, is closer to particle board and cannot be refinished. There simply isn’t enough available for our guys to do a good job. Thermofoil doors, which are coated in plastic, also cannot be refinished for the same reason. Cost: $ While the most restrictive service we offer, cabinet refinishing can prove to be very cost-effective, with a price that can be up to 75 percent lower than a full tear-out. In some cases, it can cost half as much as refacing. It’s important to remember that every home is different, and the prices will fluctuate based on a range of factors. If you are in need of an update for your kitchen, our contractors are here to offer professional cabinet refacing to Atlanta, Dunwoody, and beyond. Detail Design & Remodeling is your source for the most beautiful and cost-effective renovations in the industry, delivering quality with every service. Contact us today to learn more or to receive a quote for your kitchen!